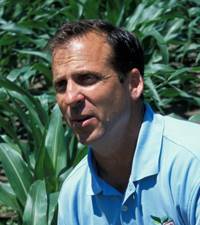 Howard Brown is currently the Manager of Agronomic Information and Environmental Stewardship for Illini FS. Illini FS provides farm inputs and agronomic services for Champaign, Clark, Douglas, Edgar and Vermilion Counties in east-central Illinois. Dr. Brown promotes nutrient stewardship among Illini FS, producers and farm organizations by providing a new approach to nutrient management fondly called a “Focus on MOM” and works with environmental groups to demonstrate agriculture’s commitment to resource stewardship. He launched N-WATCH in 2010 and has recently released an improved version of the concept, N-TRACKER at over 141 field sites. Dr. Brown is continuously looking for ways to bring farm profitability and environmental stewardship together. "It is only when we can improve environmental stewardship and farm profitability together that we achieve sustainable voluntary improvements with environmental stewardship". He has served as an Adjunct Assistant Professor at the University of Illinois for the past 18 years instructing courses, such as Soil Fertility in Cropping Systems and Nutrient Management and Environmental Stewardship in the Off-Campus Master Degree Program. Dr. Brown is a Past Chair of the International Certified Crop Adviser Board and serves on many other advisory groups and committees involved in agriculture production and nutrient stewardship.